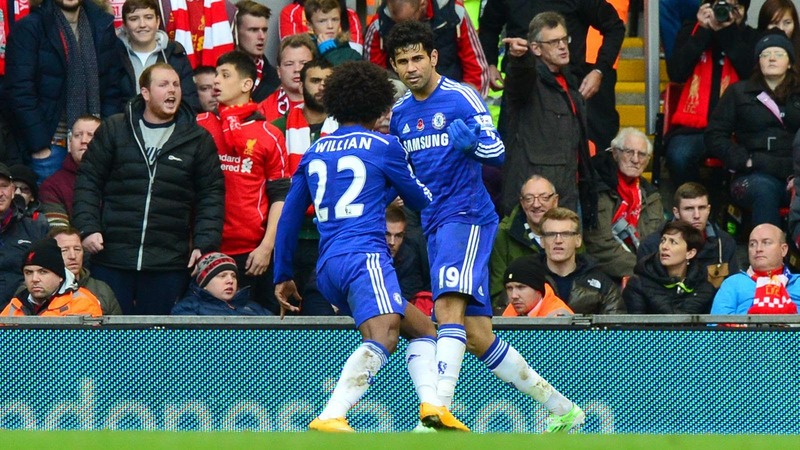 Liverpool 1-2 Chelsea: Back-to-back wins at Anfield and an excellent three points! Seven months on, and with a Bus nowhere in sight, Jose Mourinho took his unbeaten Chelsea side to Anfield looking to inflict back to back defeats on Brendan Rogers' men. Goals from Gary Cahill and Diego Costa delivered exactly that! Make no mistake, Chelsea were (for the most part) a class apart and dominated Liverpool as a total contrast to the previous encounter back in April. Back then, Jose Mourinho had sent a team out to play counter attacking football and to defend and frustrate the life out of the opposition. At Anfield yesterday, this new look Chelsea team really took the game to Liverpool and were fully deserving of the three points as they dominated for major spells with the hosts struggling to come to terms with our quality. Liverpool bemoaned the refusal by the Referee to award a penalty late on as Gary Cahill threw his body at the ball to block a Gerrard attempt late on and are still doing so. It wasn't given so get over it and move on. Chelsea were a constant threat to the home side and should have scored more than the two goals they registered. Whether it was on the counter attack of if we decided to take the game to them, Liverpool were forced backwards time and time again. Eden Hazard had another fantastic game and always gave Glen Johnson something to think about and Nemanja Matic was imperious in the heart of our midfield. Liverpool still had their moments and started the game well. 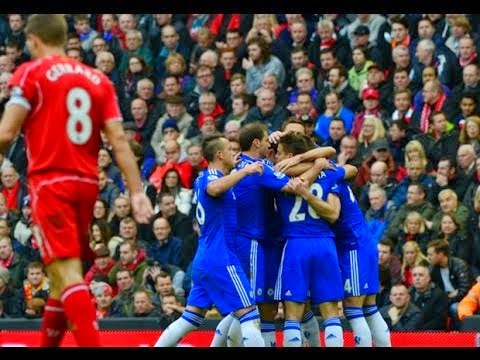 At times, Chelsea's midfield two (Fabregas and Matic) were caught too far apart and Liverpool pressed forward easily. 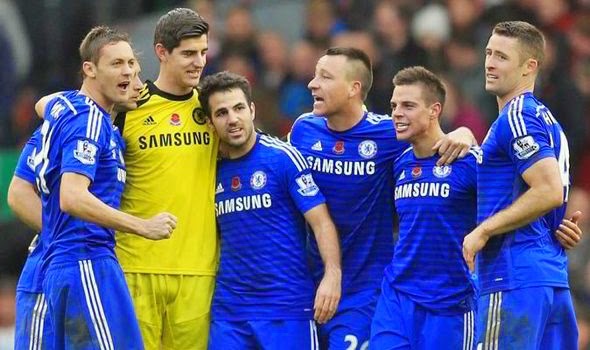 Thibaut Courtois was forced into action on more than one occasion and did well saving low down to deny our opponents. A long range effort early in the first half, clipped Gary Cahill's back and deflected into the opposite corner to where the ball was originally travelling, giving Courtois no chance at all and Liverpool were one up! We all were looking for Chelsea to respond and to do it quickly and Jose's men did not disappoint with another solid, team performance! Chelsea always looked dangerous from set pieces as Liverpool decided to adopt a zonal defensive strategy from corner kicks. With six players being six foot or over, we took full advantage five minutes or so after Liverpool had taken the lead with a goal from Gary Cahill. A Fabregas corner was headed towards goal, eighteen yards out by Diego Costa to JT and his header was blocked on the line but came to Cahill. His shot from close range was saved by Mignolet in goal but his body was over the goal line and momentum took the ball with him to make it 1-1. From that moment on Chelsea's tails were up and I never felt that we would lose the game. Raheem Sterling had Liverpool's best moment in the second half but again Courtois reacted well to get his body low down to his left and palm the shot away from danger. So to the winning goal and similar to that of his first at Burnley in our opening game of the season, the Diego Costa slammed the ball home from eight yards! Credit has to be given to Cesar Azpilicueta who worked wonders down our left hand side for the goal. A long diagonal ball came to him on the left and he chests the ball down into his path. He just keeps the ball in play, knocks it around the defender and beats him for pace to get to the byline and crosses the ball from close range. Liverpool half clear the ball but it falls to Costa and he sets himself and then powers a shot low into the net to win it 2-1 and give Mourinho's men another all important three points. The victory was massive after seeing Man City drop two points later on in the evening and we find ourselves now eight points clear of Pellegrini's men. The performance demonstrated the difference in quality between the two sides and most importantly of all, the difference in this Chelsea side compared to the side last season!